With a global perspective, Cape Breton University is one of Canada’s most ambitious universities. A little over half of CBU’s 5,000 students are from Cape Breton Island and just under a third are international in origin. 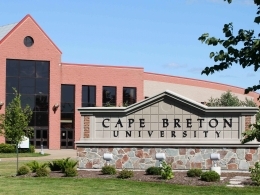 Cape Breton University is located on the East Coast of Canada in the province of Nova Scotia and is highly ranked in multiple categories. Cape Breton University has one of the highest student satisfaction rates in Canada and has one of the lowest student to staff ratios. Cape Breton is one of the most beautiful locations to live in and has an internationally renowned culture and welcoming multicultural community spirit. Students can begin their studies in most programs at CBU in September, January, or May. A new international student orientation program is offered for those entering in September. Note: the Bachelor of Science Nursing program is only available for September entry and the Bachelor of Education program is only available for May entry. Applications for admissions from international students will be reviewed on an individual basis. Require graduation from an academic secondary school program or equivalent, with an average of ‘C’ in five senior academic-level/university preparatory courses. Letter of offer issued within 7 working days. A non-refundable application processing fee of $103.00 CAD.